He woke us up early in the morning, so it was only fair that he let us take his photograph. The beach at 6 o’clock in the morning. Just so breathtakingly beautiful!!! We’re now in Brisbane, Australia after a long and tiring flight. The time difference between here and Denmark is nine hours. We’re ahead of you. We’re rather jetlagged, so are taking it easy. Will update as soon as possible. Love to you all – we’d really LOVE it, if some of you would leave a comment or send us an e-mail now and then. We miss hearing from you! Well, surprise surprise. In Las Vegas’ McCarran airport the WiFi is free. And it works. So I got my pictures uploaded. 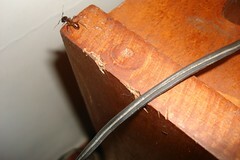 No time to load them into the blog though, so until further notice, please check them out here. Again I’m on a porch to catch the feeble signal from a router in an office. Last time I was freezing off a certain body part, this time I’m wiping the sweat off my brow. We’ve left the lovely Capitan Suizo and moved less than a 100 km. south. Mind you, the journey took five hours… It’s much greener here, because they get more rain, but still the roads are so dusty that people wear dust masks when they ride their bikes, motorbikes and dirt-bikes on the roads – or what passes for roads around here. This hotel – or lodge really – is very different from the Capitan, but also very nice. It consists of a number of small cabins or huts with little porches in front. Each cabin has a nice large room with a half partition, so the beds are separated. Centrally on the property is the open air restaurant (almost all restaurants here are open air – a steep roof on pillars and a kitchen in the back) and the swimming pool. We don’t use the pool as much here as in the other place, because this one is very deep and not as big. Besides, the sea is 25 meters from our cabin. The Pacific is even wilder here than in Tamarindo. At high tide the waves are awesome! Which is why we only let Dane surf at low tide. The waves are still pretty wild then, but more manageable. This is another surfer’s paradise, but these surfers are a lot different from the bums at Tamarindo. These guys – and some girls – live for surfing. Their lives revolve around that board. 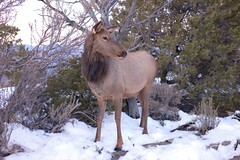 They are mostly young, but there are also quite a few in their thirties and maybe even older. They have lean, muscular bodies with tans worth dying for, big and generally very beautiful tattoos, long sun-bleached hair, wear long shorts and washed out t-shirts. It seems that the only things they spend money on is surf-gear and sunglasses. Very fashionable sunglasses they all have! They surf from the early morning just at sunrise, which is around 6:30 till they have to go to work. The good(looking) ones teach surfing school, the less fortunate tend bars and work in surf shops. The girls are almost all very, very pretty and the predominant fashion is tiny mini-shorts that almost cover their buttocks and skimpy little tank tops. They are also tattooed. The surfers come from all over the world to surf these fantastic waves. Life is very laid back here. Apart from the surfers, there aren’t many tourists. And some of them are clearly parents, who’ve come to visit their straying offspring. You only have to walk a few steps along the beach to have it more or less to yourself. Only time you see crowds are the obligatory sunset half-hour. At 5:30 everybody is at his or her favoured spot on the beach (not too far down, because the tide comes in with surprising speed at this time) with drink in hand to watch the sun set over the Pacific. And what a sight it is! We had heard and read about the rare resplendent Quetzal before we took our tour of the cloud forest. And as they estimate that only 50 pairs are breeding in Monte Verde’s cloud forest, we hadn’t imagined seing more than a fleeting glimpse of this incredibly beautiful bird. But again we were so lucky – our guide spotted a beautiful male perched on a branch no more than 20 meters away, maybe less (I’m no good at estimating weight and lenght and that sort of thing). Anyway, we could see it clearly with the naked eye and close up with our binoculars and with the guide’s telescope, through which the above photograph was taken. On the three hour trip we also saw a number of different colourful hummingbirds (very noisy birds! I’d never have imagined), a rather large tarantula (asleep in its hole, luckily) and a number of other birds and dozens of different orchids and other exotic greenery. 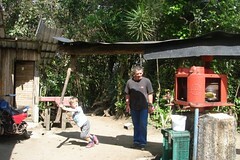 In the afternoon it was time for our visit with the Monte Verde fair trade spokesperson Guillermo and his family. His beautiful, charming 14-year old oldest daughter Maria showed us the way – in 100% perfect English, since Guillermo and his wife Ana have their children in the Quaker school, where they are taught a number of classes in English. We share many values with the Quakers, catholic Guillermo and Ana told us. Well, we do too! The next day we followed the bumpy road down to the Guanacaste peninsula towards our next destination: Tamarindo. The town of Tamarindo, sitting on the most beautiful stretch of beach, a surfer’s dream, is on the brink of over-development. It’s brimming with American tourists and surfer bums and on every street corner, somebody is trying to sell you a time share apartment. The hotel our travel agent had provided turned out to be quite awful, which was a surprise, since the other two hotels had been so nice and we hadn’t been warned that this one was below standard. Not only was it practically ON the extremely dusty and noisy road, the rooms were tiny, had no space for clothes, let alone empty suitcases. There were around 10 worn-out plastic chairs scattered around the minuscule swimming pool and the so-called children’s pool was the size of a large bathtub. 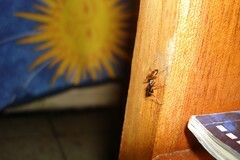 But that was the least of it – the room was filthy and it was full of very large ants. They were everywhere, litterally. So we checked out. And are now at the lovely Capitan Suizo where we were lucky to get their smallest room (considerably larger than the other one, though) at a very good price. 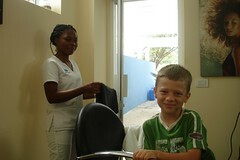 And that includes impeccable service, a beautiful garden full of exotic animals, a huge swimming pool and breakfast. And very, very friendly and competent staff. As Tamarindo isn’t really our kind of place, we spend the most of our time by the pool or walking along the beach in the surf. Which isn’t at all bad… Both Dane and we enjoy the fantastic wildlife in the hotel’s garden. A howler monkey. A flock of them are always around the hotel and have the kindness to wake up the guests around 6:30 in the morning with their unmistakable howling. But they are such fun to watch. 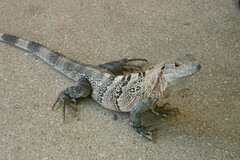 The iguanas are all over the garden and after a day or two you stop getting near heart attacks every time one of them comes hobbling down the path. They climb the trees but aren’t that good at it, so regularly you hear a big thump and it’s one of the iguanas, which has fallen out of a tree! 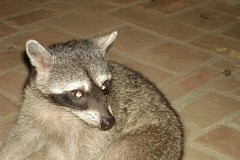 A couple of raccoons can be seen every evening and they are practically tame, as are many of the birds here. It really is heaven for children! A couple of howler monkeys silhouetted against the evening sky. More pictures here – as usual. 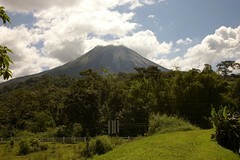 Monte Verde is so high up and so inaccessible that it’s a miracle anybody ever thought of bringing tourists up there. But luckily somebody did. On the way there, we stopped at a tiny restaurant perched high up on a hill. 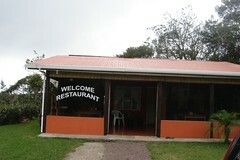 The menu consisted of fried trout with yucca fries, pinto (the local mixture of beans and rice) and sugar cane juice. The owner had the trout in a dam behind the house and went out and caught a couple for our lunch. His wife cooked them and peeled and cut the fries while we watched. We also got to make our own sugar cane juice on his machine, which he’d inherited from his dad and granddad; he proudly announced (via dictionary) that it was more than a hundred years old. The restaurant is called Florida (Flo’rida) and we warmly recommend it, if you ever take the trip from Arenal to Monte Verde. 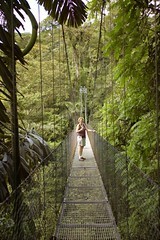 Monte Verde is famous world wide for its cloud forest. 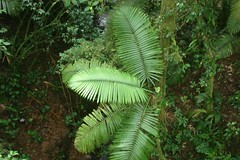 A cloud forest is a rainforest high up in the mountains, which is almost constantly covered by clouds. 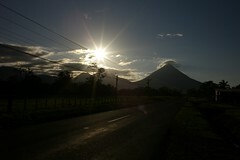 Because of its very special climate it is the place on the earth with the biggest bio-diversity. You’ll never have seen so many ornithologists (elderly men in safari outfits with huge binoculars, cameras and heavy bird books). Getting there, we were most pleasantly surprised by our hotel, which was quite lovely and where exotic birds and animals let themselves be seen and photographed in the garden. On our first day we went on a so-called coffee tour. Dane and David weren’t overly exited, but most of you know what I’m like when it’s something with coffee, organic, fair trade… So I insisted. 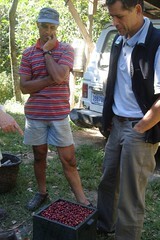 Our guide was a soft-spoken, quiet man with a mission. Guillermo is the spokes-person for the Monte Verde coffee Coop and has travelled as fair trade ambassador to UK, Scotland, Ireland, New Zealand and Australia. So obviously his English was excellent. It was just us and Guillermo and we began by driving to an overlook, where we could see the entire area and all the way to the Nicoya peninsula (jutting out into the Pacific). Up here Guillermo told us about the history of Monte Verde, which was “colonised” in the 50ties by a couple of handfuls of American Quakers, fleeing the Korean war. Read the interesting story about the opening of this remote nature’s wonderland to people from outside here. 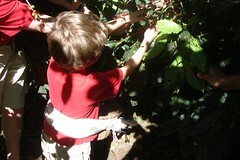 Then we drove to Juan’s organic coffee plantation. It was quite small and didn’t provide much of a livelihood for Juan, his Quaker wife and their two daughters, but with the eco-tourism on top, he could make a decent living. 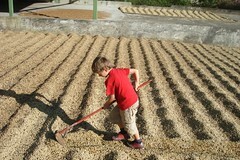 As you can see, Dane was an avid coffee picker. 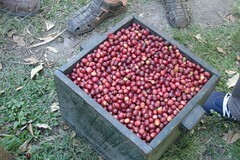 However, he was stunned to hear that a coffee picker only gets around 2$ per bushel coffee beans. It’s a bushel you see in the picture. Everybody in Monte Verde has a “kitchen garden” with some banana palms, Papaya trees, pineapple, avocado, guava, watermelon etc. and we got to admire Juan’s. By the way, did you know that a banana palm, which can grow to around 4 meters, only lives one year? It shoots out of the earth, spouts around 100 bananas and then drops dead, within one year. My jaw dropped, hearing this while standing among Juan’s banana palms. After the tour Juan treated us to a cup of coffee and a home baked cake on his porch. 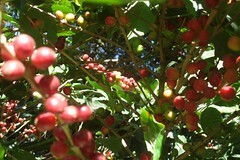 Then we drove on and saw the place where the coffee “cherries” as they are called, are transformed into lovely-smelling coffee beans. And finally we drove down to the co-op café and tasted the coffee, light roast, dark roast and natural. 1) Dane is turning the beans over. 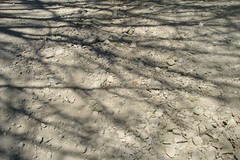 They dry for ten days in the sun and must be turned over 4-6 times a day. 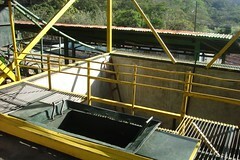 2) The coffee cherries are poured in here with water from the river. 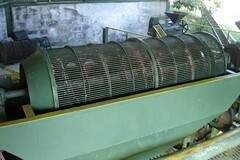 3) this machine sorts the beans in sizes. 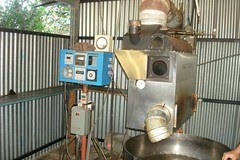 4) Here’s where the coffee is roasted. 1) looks like a volcano from a child’s drawing. 2) is covered by clouds 75% of the time and makes you say “WAUW” when it occasionally makes an appearance from behind the clouds. 3) Rumbles frequently (several times a day) so it can be heard over most of the area. 4) Spews lava that is white and smoking by day and orange-red by night. We didn’t see it at night though. Check the facts about the volcano and it’s outburst in 1968 here. 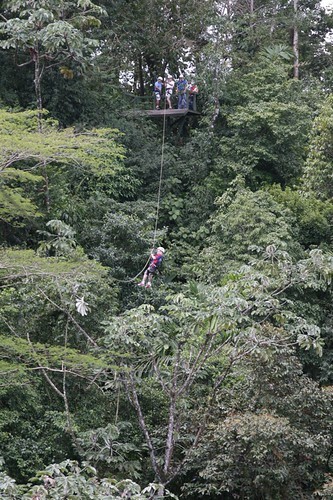 On our first day we went on the previously mentioned Canopy tour. It was SO MUCH FUN! We’d definitely do it again if it weren’t so relatively costly. 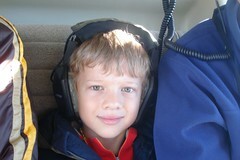 Dane is going on about it every day – how he flew over the tree tops, about the howler monkey and it’s little baby and about crossing a river 30 meters above ground. 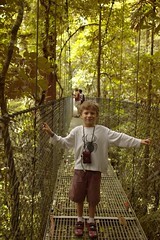 On the following day we went on a three hour tour of the so-called hanging bridges. Hanging bridges are widely used in rainforests here to be able to show off the fantastic nature to us tourists without totally ruining the eco-system in the forest. 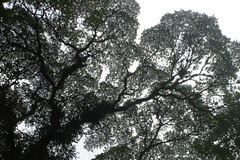 So a good deal of the time, you’re walking among the treetops. As 40% of all plants in the rainforest are epiphytes (plants that live on and off other plants), there really is a lot to see up there. In between our adventures we spent time in the lovely hot springs at the hotel, heated by the volcano. David and I agree that a so-called wet bar really is the height of decadence! More and larger pictures here. We didn’t really like it much in Las Vegas. My brother liked it more, but then he had friends there. Our last night together was really nice though, with a lovely meal at Mesa’s grill in Caesar’s Palace and two views of the great fountain show at the Bellagio. 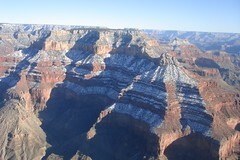 The following morning we got up early and drove east towards Grand Canyon. 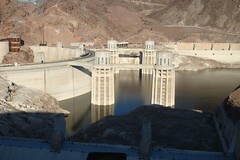 It was a long drive past the Hoover Dam and through the Mojave Desert. All the northern slopes were covered in snow and the closer we got to the canyon, the more snow and the more the temperature dropped. We had quite a scare on the way, because we discovered that we’d forgotten – or really didn’t know or thought about – the time difference between Nevada and Arizona. 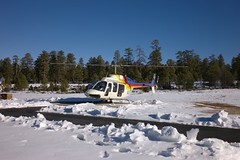 The GPS claimed that there was a two hour difference, which would have meant that we’d miss our paid-for helicopter ride over the Canyon. Luckily the GPS was wrong (something with daylight saving preferences) and the difference was only one hour. We only had a few hours there, because the drive is almost 5 hours each way. 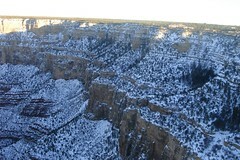 We made the most of those hours, taking a short peak at the Canyon from the rim and then driving to the helipad. The ride was half an hour, which was quite enough for Dane and me, who both got a touch of motion sickness. Also Dane was squeezed in between David and another grown man, and contrary to what we’d expected, it was very hot in there. As you can imagine it was a spectacular sight. We’ll let the pictures speak for themselves. After the helicopter ride we went back to the rim and drove along it to catch the sunset. 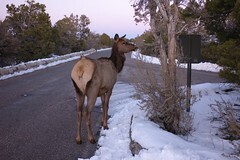 Just after sunset we met a flock of elk cows who really loved having their photographs taken. 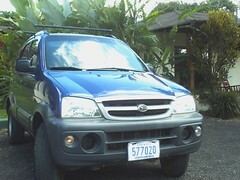 The next morning we got our rental car, a tired old 4×4. But it works. 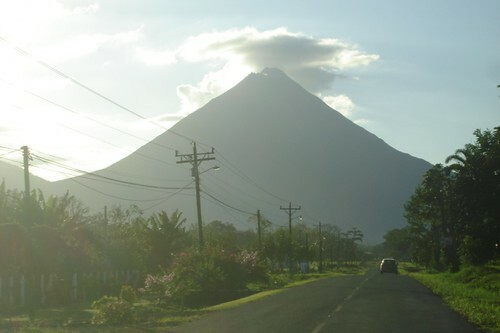 We drove 5 or 6 hours to our first destination, the lovely hotel Arenal Paraiso (if you have Explorer, you can see the hotel’s own homepage here) where every room has a view of the very active volcano Arenal. Just spectacular!! – but I’ll catch up, don’t worry! Right now I’m at a computer café, so don’t have the time to make a real post. But, briefly, we’re now at Tamarindo beach, where we don’t really fit in, it’s a place full of surfers and beach bums of all ages. Anyway, we’re at a nice hotel – after first rejecting the hotel the travel agent had booked for us, and we’ll go swimming in the Pacific soon. 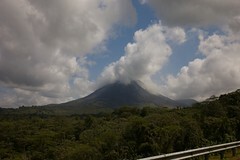 We were first at the Arenal Volcano, where the pictures are from and later up in the mountains at Monte Verde, where we took a hike in the Cloud Forest. 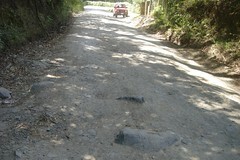 It’s the most inaccessible place in Costa Rica and you will NOT believe the condition of the “roads”there. We´re in Costa Rica now and have experienced so much in the meantime, but have no opportunity to write about it, since there´s no WiFi at the hotel we´re at and only one shared computer between all the guests. So pictures – and there are some GOOD ones – must wait. We´re doing just wonderfully and enjoying the lovely climate and fantastic nature here. 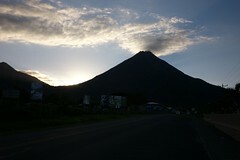 The volcano Arenal is watching over our every move these days. More as soon as I´m online again.